I work for a lot of association clients, and as a result, I interview a lot of association presidents. They’re nearly always incredibly successful people, with big jobs at big companies, and I’m always amazed that they can find the time to volunteer untold hours working, speaking and traveling on behalf of their association. But time and again, they tell me that they feel the need to pay back to an industry that has supported them for so long, or that they do it because “you get out what you put in.” I’ve heard that “get out what you put in” quote so many times I feel like I can finish their sentences for them as easily as a long-married couple. In my own life, I tend to be a joiner and a doer. I love a good cause, and I’ve sort of made it my personal mantra to never complain about something if I’m not willing to do something about it. That’s not always possible of course — there are plenty of times I have a good kvetch about something without having the slightest plan to do a darn thing about it. But for the big issues … the stuff that really gets my goat … the stuff I’m truly passionate about? That I’ll commit to doing something about. And just as all those association presidents have been telling me over the years, it feels great. I get out more than I give. It’s awesome. Below, then, are two articles that I think are perfect illustrations of this. I share them not to toot horns. Rather, I share them because after it was all said and done, I got this huge outpouring of thanks from other parents in my community, and it made me feel all warm and fuzzy knowing that by having this story played out this way, it helps everyone remember that change doesn’t have to be hard. That little actions by many can result in one huge (fabulous) thing. So I hope, I truly truly truly hope, that if I’ve inspired even one person to stop kvetching and start volunteering, than the success of this little project of mine has been way more worth it than just the act itself. And that’s cool. Beginning later this year, blowing past a Falls Church City school bus with its flashers on and stop sign out will cost drivers $250. The new law follows a year of work by an FCCPS parent, a Falls Church school board member and finally the unanimous support of the City Council. So last year she began her quest to do something about it. Working with Transportation Supervisor Nancy Hendrickson and Falls Church Officer Mary Gavin, the three researched the law to determine how best to proceed and brought their research to the school board. 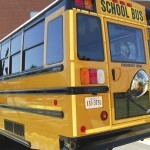 In October FCCPS school bus drivers tracked violators over the course of three days and documented 60 incidents of running school bus stop sign arms. With data in hand, the matter was presented to the City for action. Sharpe drafted a proposed ordinance to be presented to the Council before their December 17th meeting. And Monday night, Council unanimously approved. “It was definitely a feel-good, ‘it takes a village’ moment,” added Oppenheimer. It’s illegal in Virginia to drive past a school bus while it is picking up or discharging students, not to mention very dangerous. But who could consistently enforce such a law? 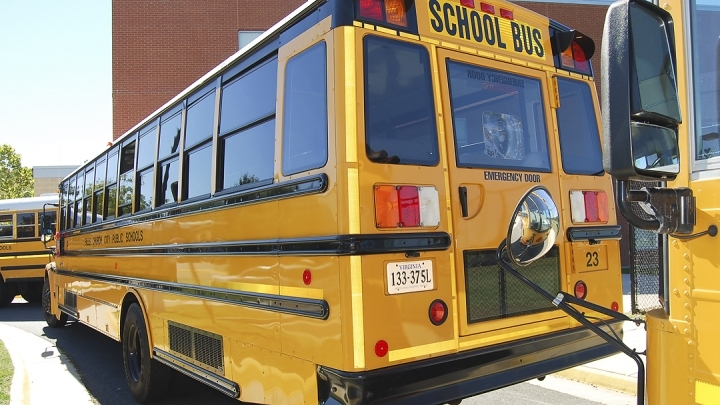 Falls Church City says it can, and it approved an ordinance Monday night which would make it the first jurisdiction in Virginia to use video surveillance cameras on the outside of school buses to capture license plates of those who drive past the flashing red lights. “This came from the community,” said city spokeswoman Susan Finarelli, who said that citizens complained they frequently saw drivers cruising past stopped buses. In November, the city asked its bus drivers to keep track of how many cars illegally passed them while they were loading or unloading. In three days, the drivers reported 60 violations. By unanimous vote, the Falls Church City Council approved placing video cameras on the rear corner of some or all of the city’s 17 buses, who cover more than 155,000 miles per year. No vendor has been selected, but the two biggest manufacturers both told Falls Church that they were the first in the state to adopt such a plan. The vendor will monitor the footage and supply possible violations to the police. A sworn officer will review the tape and issue a civil summons if the license is clear and the violation is apparent. A $250 fine, but no traffic points or convictions, will be assessed, and it doesn’t matter if you weren’t driving: if it’s your car, you’re liable under Virginia law. The city hopes that the cost of the cameras, and using the vendors to monitor them, will be roughly balanced out by the fines brought in from the violators, Finarelli said. She didn’t know how many of the buses would be equipped with the cameras — no vendor has been hired yet — but said it would be on the buses with the mostly high-traffic routes. Oppenheimer said the program’s goal is not to make money, but simply to stop drivers from passing buses. “Keeping our youngest citizens safe is far more important than any revenue,” she said, “and that point was repeated again and again last night” by the Falls Church council. Some people have to work on Columbus Day. Some get to stay home, sleep in, go to the movies, go shopping, heck, I don’t know … buy a mattress on sale? Do mattress stores have sales on Columbus Day, as they seem to for all other American holidays? Anyway. My husband and I decided it should be a day that we’d go explore a new world with the kids. We thought about corn maizes and pumpkin patches, or maybe just a little hike at a nice park near our house. But then I remembered an article I read the other day in The Washington Post, about a coalition of citizens who were working to help save “Tysons’ Last Forest.” The article said that in looking at ways to alleviate traffic in Tysons, Fairfax County’s comprehensive plan includes an “Option 3”, which basically means running a four-lane connector road for the Dulles Toll Road right through the heart of the forest and stream valley. 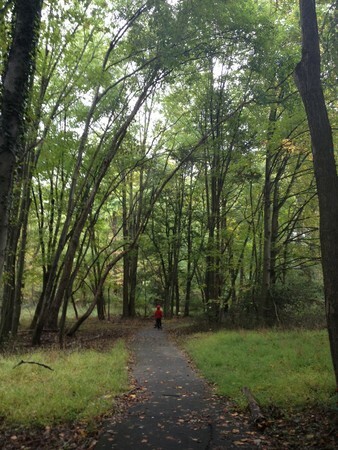 Now I have to admit something: I’ve lived in Northern Virginia for a really long time, and I’ve been hearing about this secret little forest in the midst of Tysons Corner for what seems an equally long time. But I’ve never been there, and for reasons I can’t quite put a finger on, I never really pursued trying to find out where it was. I had my own favorite places to hike in the woods, and I guess I just thought of Tysons as the place to sit in traffic while trying to get to The Container Store. But this article stuck with me, and I suggested to my husband that we go check it out. We weren’t quite sure where exactly to park, but with some explanations from my mom, who has lived here for 40+ years, our GPS and an iPhone with Google Maps still loaded on it, we hopped in the car. A few wrong turns later, the minivan was parked and we were curiously poking through the forest’s edge. Twenty seconds later, my husband yelled that he found the trail, and off we went, headed west through the woods. We scrambled over fallen trees, twisted around piles of deadwood from a recent storm, came upon an old paved path and some Parcourse equipment that I imagine some corporation installed years ago for their employees. Eventually, the boys got tired, and the oldest started asking when we were going to turn back. I begged for just another minute and just then spotted a huge, massive tree. It had to be well over 100 years old, and I had to see it. As I hopped up the bank to see it, I saw something perhaps even more incredible: A huge, old farmhouse, shutters hanging at crazy angles, an old brick outbuilding tucked behind it. “Ash Grove,” a historical marker said, circa 1790. Built by Thomas Fairfax. Suddenly, I started picturing a bunch of little Fairfax kids running around the very forests that my boys were now running, and this whole entire day went from being a really exhilarating, exciting experience to a heartbreaking, painful one. Would the powers-that-be really, seriously, destroy all of this—indeed, Tysons’ last remaining forest—for an exit ramp? Could they? As we neared the end of our hike, two deer raised their beautiful heads and gave us a quick look before bounding away. My son stared after them, surely the closest he’s ever been to a deer. And I vowed that I would try too, to do what I can to help save this forest. It’s too important to not even try. (For more information about the issue in general, visit http://www.savetysonslastforest.org/. To sign a petition for its protection, visit http://chn.ge/UmWATq. Disclaimer: What I am not: I am not a homeowner in the Tysons Corner area, nor am I am a member of the coalition working to preserve it. In fact, I don’t even live in Fairfax County anymore (I live in Falls Church City). What I am: I am a lifelong resident of Northern Virginia, and I grew up in Fairfax County during a time when cows still lived in McLean (corner of Swinks Mill and Georgetown Pike). I am a girl who once cried as I watched, from the window of my third-grade classroom at Spring Hill Elementary, hundreds of trees being cut down for what would become the Summerwood neighborhood. I am a woman who loves to hike, loves being outdoors, loves wildlife and trees and clouds and water and wind. I am a mom to two boys—a mom who feels like I’ve done my job well if they come home with muddied knees, stones and acorns in their pockets, and the perfect, most excellent stick they’ve ever found clutched in their dirty hands. This article was originally published October 11, 2012 on Patch.com. So I’ve always had fond memories of Disney. My first trip there was in the 1970s with my family, via the Amtrak Auto Train. When Epcot opened in the early 1980s, my mom and I flew down to stay with my Godmother and see what all the futuristic fuss was about. When I graduated from high school and my four-years-older-than-me brother graduated from college, we took a super fun sister-brother trip there. I checked it out a few more times when I was working at Orlando-based conventions, and all the delegates were out golfing. The last time I was there, Hurricane Jean forced us to hunker down in a windowless room at a college friend’s house instead of riding Space Mountain, but we still had a blast. And any time I’ve ever been asked what famous person I’d like to meet, I’ve always said Walt Disney, because I figure he must have been a crazily inventive, imaginative, curious, whimsical and optimistic guy, and I like those kind of people. In spite of all that, I’ve never felt as though I had drunk the Kool-Aid when it came to Disney. Yeah, it was a cool place, but I couldn’t quite understand why young couples chose it as the site for their destination weddings. I thought friends who went there in the midst of a boiling hot Floridian summer with little kids were nuts. I couldn’t understand why anyone would want to honeymoon with nine billion other people in long, hot, sweaty lines. I would occasionally watch those YouTube videos of kids completely and totally freaking out as they learned that they were going to Disney, and I couldn’t fathom my own children having any such reaction: As boys, the whole princess thing was lost on them; they’re terrified of roller coasters and most other rides; and to them, “Disney” meant movies—not a destination. But then two critical moons lined up: First, Legoland opened in Orlando in October. Second, our good friends and neighbors asked if we’d like to join them on a trip down there, using their Disney points for our “on-property” (check me out, knowing the Disney lingo!) accommodations. Kool-Aid or no, our answer was a resounding yes. We made a plan for a five-day trip over the MLK holiday weekend, scored some buy two/get two free tickets to Legoland, bought four-day Park Hopper passes (more expert lingo! ), and waited. If anyone asked me about our plans, I would blithely wave my arm in the air and make it clear that we hadn’t drunk the Kool-Aid, and even if we spent a few hours a day in the parks and the rest of the time lounging around our hotel with our friends, we’d be happy. We had no intention, said I, of stressing out over a trip to Disney. The week prior to our departure, Disney veterans spoke to us earnestly about Fastpasses. A free app that tells you in real time what the wait times are at every ride. A book about how to maximize your Disney experience. Web sites to help you plan your visit. We turned it all down. We’re doing Disney the Oppenheimer way, we said, which means no. stress. The day before we left, our cat sitter told us the sad tale of a colleague who flew her entire family down to Disney over Christmas, only to be told at the gates that the park was at capacity, and they couldn’t come in. At the airport, we ran into a teacher from my younger son’s school, who cheerfully told us that she had just checked some Web site that rates the parks’ crowdedness, and that Saturday and Sunday were both forecasted at “9”, with 10 being the most crowded it could be. Our plane was on time. Our rental car perfect. Check-in easy. The pool water warm. The sunset lovely. The next morning, giraffe and zebras and Ankole cattle wandered around right outside our balcony, munching on grass as we ate our breakfast. It was nature nirvana. We hit Legoland first, arriving bright and early to a parking lot so empty it reminded us of National Lampoon’s Vacation. But unlike the movie, the park wasn’t closed—we just had it all to ourselves. At the Disney parks, we’d head to the most popular rides first for the oft-mentioned Fastpasses, only to find that there were no lines. We’d wander by a show by happenstance, only to see a sign announcing the next performance was in two or five minutes. Trains arrived the moment we’d step on the platform. 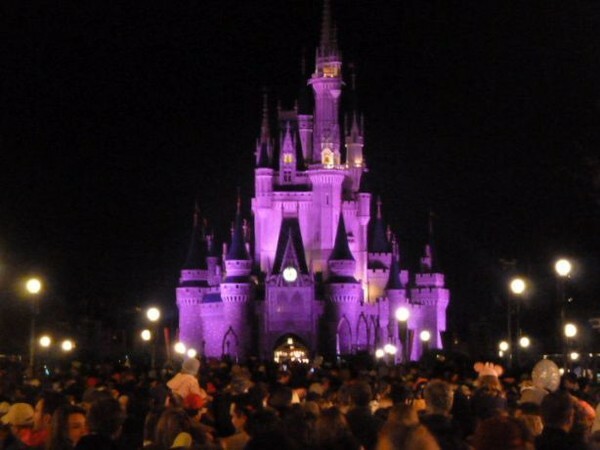 We felt for sure we’d miss the evening fireworks display when our shuttle bus had to take a detour; instead, we arrived at exactly the moment the show began, with a perfect view of the Magic Kingdom’s castle. We signed up for a character breakfast and were one of the first families seated, so we didn’t even have to wait in line for personalized Mickey pancakes. We felt like the golden family, breezing through Disney as if an advance team had cleared the way for us. It was bizarre—too perfect, really—and as every minute passed, I started feeling the Kool-Aid. The parks were clean. The workers kind and helpful. The whole shenanigan expertly and perfectly planned. Seamless. Enjoyable. Magical. And I realized that in the midst of all the talk of Fastpasses and apps and manuals and how-to books, the one thing no one had mentioned was the difference—the difference between going to Disney as a kid and going to Disney as a parent. Because the ability to bring a kid to Disney, I’ve decided, is the closest I’ll ever come to feeling like I’m some sort of superpower rock star parent. To watch their mouths open in wonder as fireworks explode over a glowing castle … to hear them laugh a big belly laugh as Winnie the Pooh gives them a big hug … to watch their faces turn from fear to joy as they rode their very first roller coaster? Yup, I’ll drink to that. This article was originally published January 27, 2012 on Patch.com. To be specific, kids’ birthday parties stress me out. It could be that it’s because I’m a Christmas baby and therefore have very few nostalgic memories to fall back on when it comes time to think up great ideas, because I’ve had very few birthday parties. My mom tried really hard to make my birthdays special, but let’s face it: It’s pretty hard to separate a kid’s birthday from The Big Man’s birthday. A few friends over for cake and games? Forget about it – they were all out of town. A slumber party? Puh-leeze. Cupcakes at school? Nyet. One year, she decided to throw a half birthday, with a “Christmas in July” theme. She propped up a fake tree on the back patio (remember when we called them fake instead of artificial? ), decorated it with balloons, and set us all up out in the backyard for a day of summer frivolity and fun. It was pretty great, until one of the moms called her later and asked her to never pull a stunt like that again, as the woman’s son apparently expected Santa to come and was sorely disappointed when he didn’t. As I aged out of little kid parties, things didn’t really change for the better: I had to wait three whole, agonizing days after my 16th birthday for the DMV to re-open so I could go for my driver’s test, only to be rejected because my driver ed teacher accidentally wrote my date of birth as 12-25-83 instead of 12-25-67. The only solution was to wait until school re-opened in January. And then go back to the DMV on yet another (later) date. When I turned 18, I couldn’t go out for a celebratory beer like all my other friends did. My family threw small surprise parties in honor of my 25th and 40th birthdays, and they were both wonderful, but each time, it was hard to ignore the absence of so many beloved friends who couldn’t come for obvious reasons. So cue up the violin strings and feel sorry, because my birthdays pretty much come down to cramming in a piece of birthday cake after a huge Christmas meal and then straggling off to church, all the while hoping that at the very least, we’ll get a seat. Good times. But now that I’m a mom to two birthdate-blessed boys (October and May – possibly the two most beautiful months in Virginia), I’m realizing that my lack of personal birthday party experience continues to be a hindrance as I try to give them what I didn’t have. I spend an inordinate amount of time trying to figure out a plan that won’t break the bank but that will be fun for all the kids. If the plan is to be outside, I spend an inordinate amount of time checking weather.com, starting a week before the date, maniacally checking for the chance of rain, hitting the hourly forecast refresh button like a drug-addled woodpecker. If the plan is to be at a location anywhere near the beltway, I spend an inordinate amount of time worrying whether there will be a colossal traffic jam, causing all the guests to be late, leaving my poor birthday boy all alone on his birthday. 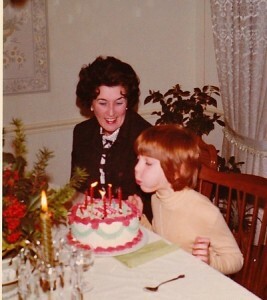 We revisited past (cheap) themes – a bowling party or a pizza/movie night at our house – but both were rejected because, God forbid, “we’ve already done that, Mom!” Seriously, it must be a bummer to have a cheap mother who doesn’t have a lifetime worth of party ideas in her back pocket. Ultimately, we settled on an ice skating party, held on a gorgeous sunny day. (Oh no! Are people going to be irritated that they have to be inside on such a beautiful day?!) The party room was ready for us, and all nine invited boys showed up right on time (Yikes! Did I order enough pizza?! ), the assigned host/helper was a doll (GeezIforgottoaskifIcanincludethetiponthechargecard!). Skates were pulled for us (They’re out of size 4s??? ), kids were bundled out on the ice (Are three adults enough to help those who can’t skate?! ), and everyone had a blast. They loved it. They fell, they got back up, they skated. They swirled and crashed and hung on for dear life, but they had a great time. And every time I looked at my sweet son, surrounded by his sweet friends, I saw him smiling the most perfect smile. A happy, uncomplicated, wriggling-puppy smile. It’s what fills my cup. Another party, another success, another one done. Another year closer to the time when one isn’t expected to throw their kids a birthday party (When is that, exactly?). Another year closer to being a crying, sorrowful empty-nester. And another year of realizing that my mom must have felt like she hit the jackpot when her third kid ended up being a Christmas baby, and “organize party” fell from her list of responsibilities like a stone. This article was originally published December 1, 2011 on Patch.com. I’m the youngest of three and have two older brothers, and it seems that when there’s one girl and multiple boys in a family, there’s very little middle ground—the girl ends up being either uber girlie, or a serious tomboy. 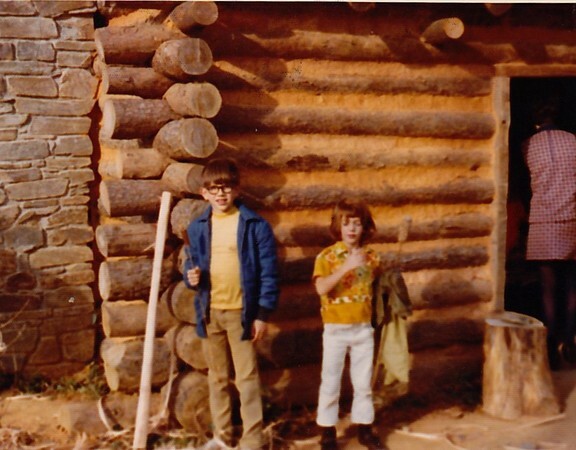 I was the latter, preferring Toughskins jeans, hand-me-down tee shirts, and beat-up, nondescript brown jackets over anything that remotely looked like it came from the girls department. My mom occasionally tried to get me to wear a dress, but her efforts didn’t always work out so well: I very clearly remember scribbling brown marker all over the front of a dress I hated and telling my mom it was dirty. She was furious—the dress, in retrospect, was pretty cute, with a big red tulip hand-stitched on the front—but I found it itchy and horrible, and it was, well, a dress. My punishment was that I had to wear the dress for three straight days, with brown marker all over the front, and I think that was about the last time I ever pulled a trick like that. But it certainly didn’t make me embrace dresses, or tulips for that matter. Not surprisingly, I spent a good deal of my childhood explaining to people that I was actually a girl. At one of my parent’s parties, the hired bartender asked me if I wanted a Roy Rogers, when all I really wanted was a Shirley Temple. A helpful salesman at Crown Books directed me to the superhero section instead of Nancy Drew. The barber who cut my brothers’ hair once gave me a boy haircut too, not quite understanding why I was crying by the end when I realized that the clippers he was using weren’t for neatening up edges but, rather, for cutting all the hair over my ears in a neat half-moon. Things didn’t change all that much when I fell in love with horses and started spending all my time at the barn with other girls—while they rejoiced in wearing jodhpurs and beautiful paddock boots, I was happiest in jeans and muck boots. They braided manes and tails while I shined saddles with spit and Murphy’s oil soap. And now, I’m the mom of two boys, which was probably a supremely smart move on the part of God or whomever is in charge of doling out babies to families, because I am far more comfortable digging in the dirt for worms than I am digging through piles of princess barrettes. And after growing up with boys, I find it relatively easy to interpret what is a preoccupied grunt vs. a rude grunt, or what is a game of hitting and kicking vs. an actual fight. I understand that being the mom of two boys is very similar to being the caretaker of two Labrador puppies: They need to be taken outside daily for a run, and their paws need to be wiped off before coming into the house. Still, there are times when the inner girl in me cries out for a little attention. My dreams of reliving my youth at the stables was quashed early on, when both my baby boys cried in terror at a County fair’s pony ride, and when they refused to even look at the beautiful Park Police horse on the mall, let alone pose for a picture with him. My warm fuzzy thoughts of buying cute little outfits for cute little darlings were dashed when I realized that a) kids’ clothing stores are 75 percent pink and 25 percent blue, and that b) boy clothes are boring. Girls get to wear all sorts of awesome, outrageous clothes, mixing stripes and polka dots with abandon. They wear bedraggled tutus over snowsuits, socks of different colors, and hats and scarves that look like they’re straight from the pages of a 1980s Benetton ad. Boys wear basically the same clothes at five that they will at 50—gym shorts and tees, khakis and a Polo, jeans and a sweatshirt. Even shoe shopping is dull, as we pass by shoes with fantastical sparkles and neon laces for sneakers that look exactly like my husband’s. Yawn. Even at school, I can’t help but notice that girls get to participate in the super cool Girls on the Run program, giving them a boost of self esteem, a shot of some healthy living, and the joy of participating in a large-scale athletic event with zillions of other girls. I’m so envious of Girls on the Run that I’ve come close to asking my neighbor if I can adopt her girls for the day and wear a pink tee while we’re running. Sadly, there is no Boys on the Run program. So when the inner girl speaks, I find myself praising Lego and gratefully acknowledging that we live in Northern Virginia, next to a huge shopping mall. Because on those days, I pack up my boys and head to Tysons. They get the Lego store; I get to window shop, taking in some sparkle and bling and dazzle in a place without bugs, mud or sticks. Really, it’s a win-win. This article was originally published September 21, 2011 on Patch.com. Years ago, pre-kid, I remember reading a pretty amusing article in the Post about some of the crazy things docents at the Air & Space Museum overhear parents telling their kids when asked a question to which they don’t actually know the answer. The article was full of hilarious anecdotes that made it pretty clear that many parents, when faced with a difficult question about aviation or space exploration, simply made up an answer to satisfy their child’s yearnings. Around the same time, my husband and I happened to meet the curator, and he confirmed what the article said: The answers, while creative and amusing, were almost always false. I am convinced this was not the case during my childhood, because I am convinced that my parents didn’t make up the answers. I believe this because in our household (no offense, Mom), my brothers and I directed the vast majority of our questions to our dad, who seemed to know everything. His credentials were solid—PhD in chemistry—and he has this kind of quiet, understated presence about him that just make people listen to him and, at least for us, believe everything he said as the absolute truth. He has authority without being authoritarian. His knowledge was also startling in its breadth: One day, my brother and I decided to play “Trivial Pursuit” with him. He had never played the game before, so we let him go first, and one by one, he marched his game piece around the board, ticking off the answer to every single question and filling all of his little colored pie wedges before either of us had even had a chance to roll the dice. When we sort of helplessly shrugged our shoulders and told him that he had won the game, he looked at us like we were crazy. What game, he wondered aloud, only lets one person go before it’s over? Meanwhile, we recognized that a man who can recite the periodic table of chemical elements and tell you who won a 1954 Oscar for Best Actor is perhaps not the guy you want to pit your mind against in Trivial Pursuit. Sadly, I have not followed in his footsteps. In fact, I often wonder if my own kids think I’m an idiot. It’s getting to the point that I too am beginning to wonder the same thing, as every day, my children find new and creative ways of discovering how little I actually do know. I’ve been asked who invented cotton candy and how many people have climbed Mt. Everest and how many dogs are there in the world. I’ve been asked about meteors and comets and the speed of light and even how many gallons of water are in the ocean. I don’t think I could even tell you how many gallons of water the average bathtub holds, and to be honest, I can’t say I really understand how fax machines and televisions work, either. I don’t make up answers though—no, I’m not like some of those parents at Air & Space. I just say I’ll google it. And google it we do, my husband and I. Reams of paper have been printed with explanations of hundreds of seemingly unanswerable questions. It’s turned into a bit of a game, actually: Almost every night, each boy asks a question, and one of us (usually my husband) googles it after they go to bed and leaves the print-out for them at their place at the breakfast table. This is all well and good, and we’ve learned some fascinating things (The world’s largest swimming pool is in Chile, in case you’re interested, and is eight hectares in size. ), but Parenting by Googling doesn’t work so well when you’re not within reach of a computer. Seems when I do have all the answers, no one is asking the right questions. This article was originally published September 7, 2011 on Patch.com.